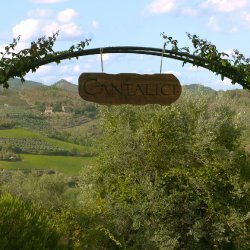 In the heart of Chianti Classico, not far away of Gaiole in Chianti, in Castagnoli lies the winery “L’Antica Fornace di Ridolfo” of the brothers Carlo and Daniele Cantalici, under which name the winery is also known. The history of the vineyard goes back to the 16th century. It is deeply connected to regional tradition and the beautiful landscape. 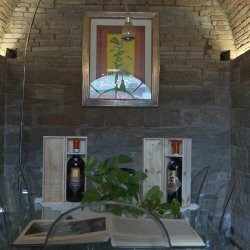 Wine is the passion of both brothers, who are inspired from the unique landscape, each and every day. The branches bear three types of grape, such as Sangiovese, Trebbiano and Foglia Tonda. These are thoroughly taken care of, until they are being harvested by hand. 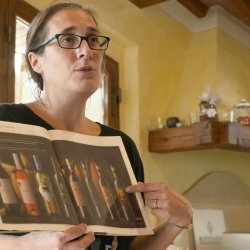 Carlo and Daniele give their wines, which are already climatically favoured, an excellent and characteristic note, thanks to their craftsmanship. 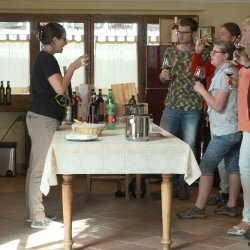 A wine tasting at the fantastically located winery Cantalici is almost part of a stay at Podere L’Aquila. 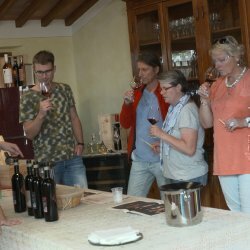 Here, wine experts and wine lovers get to know the history of the vineyard, the Chianti in general and further sorts of wines and grapes. 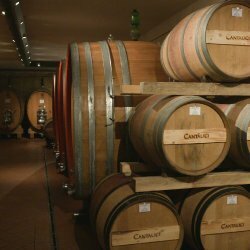 Also, the wine cellar with its innumerable French oak barrels of tasty wines, can also be discovered. 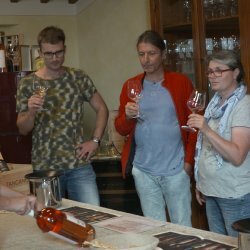 If you are lucky, you will get to see also the spectacular wine bottling process.